Solutions to the barriers faced by quadriplegics and the technology to make life easier. I'm back from my long hiatus with a few new items to post. I know it has been too long, but I feel like I have nearly completed everything I, personally, have to share. As new technologies or barriers are faced I will share them, and there's one that really got under my skin yesterday that I may need to rant about on here, soon. 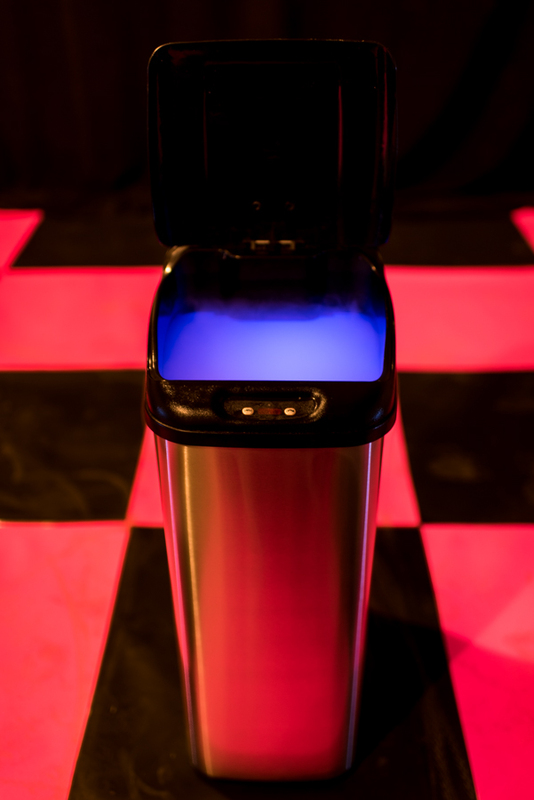 For now, a simple, affordable and very useful piece of technology is the infrared activated garbage can lid. It can be difficult enough with functioning hands to bring a load of garbage to the can and open it without leaving any mess in the process. Add to that paralyzed fingers and often our dexterity itself is not enough to carry garbage over, let alone open the lid. Obviously foot pedal operated garbage cans don't work for us and many of the good cans out there are spring-loaded or designed in a way that the lid cannot stay open. With these cans, if you know you will need the lid open for a significant period of time, there are buttons to press to keep the lid open until you press the other button to close it. These cans are not perfect. In my opinion, they automatically close too soon after opening and are not sensitive enough to stay open when a person's hand is still over the sensor while depositing multiple pieces of garbage. The first one that we had had critical parts, the gear responsible for opening the lid, made of plastic that broke far too soon, rendering the automatic lid useless, even after being repaired with some epoxy. Charge me an extra five dollars and make those important pieces of metal. Also, as entertaining as it is for children and some seniors, they almost need to come with instructions on the front indicating that you don't need to close the lid. All you will be doing is breaking that plastic gear I just spoke of. That said, using D batteries, it will open and close thousands and thousands of times between needing new batteries, so, as long as they don't break the lid, let the kids play. Source: The best one we've bought came from Costco for about $40. Other department stores like Canadian Tire carry them but are way overpriced until they come on sale, like most of the items at Canadian Tire. I haven't disappeared forever and Challenging Reality is not finished, yet. It's just that I've had some excellent opportunities to work on even larger projects that will help more people in even greater ways than what I've done here. When those opportunities come I've had to take them. As they wrap up, and a smaller two-week project for the health region begins soon, I can begin thinking about the work here. One item that I've been meaning to highlight for a long time is a Swiffer Duster. Any wand type duster will work, I just happen to have the brand name at home. That said, it's not that I use it nearly as much as I should. I greatly appreciate my wife's keeping of our home and feel as though what I am able to do, and am able to reach, is not the most efficient use of my time if I could be cooking, washing dishes, managing finances or the other tasks that I excel at more than cleaning. As simple as these static charged dusters are, they work even better in combination with The Gloves, as do so many of those things that require a little bit of dexterity to use effectively. I imagine that a universal cuff, or other strap to assist in securing the duster to your hand, would do a fine job in giving the strength and grip necessary for something as light as a duster like this. The little bit of extra reach, the lightweight nature of the product and the effective way that it picks up dust makes it a fine product for quality cleaning, whether being used by a disabled person or an able-bodied person. Last week I discussed Handicapped Parking Spaces and Placards.The irony of this video making its way into my presence into my newsfeed via Reddit, just a few days later, is quite remarkable. Without question some of the most effective anti-drinking and driving or anti-texting and driving advertisements are those that shock and surprise a person. After all, it's becoming more and more difficult to make an impact on people as we grow increasingly desensitized. I don't have a problem with shocking advertisements in the safe situation such as watching TV or YouTube. However, as you will see in the video below, my concern is that the surprise my cause a driver to slam on the gas, instead of the brake. Watch for yourself. I can't say that I have a problem with this strong approach. It's clever and makes people think. It may be Russian, Russian drivers may purportedly be less considered about leaving accessible spaces open to those needing them, but I'm pretty sure the message is transferable to just about anywhere in the world. I don't know if I like the shock it might cause a driver but maybe it would make them think twice and never forget what they saw. Still, face-to-face communication and a growing understanding is probably more long-lasting and encouraging but it's pretty difficult for us disabled people to connect with everyone we would like to educate. Good on Russia for addressing the problem. A lot of blatant accessibility problems in Canada never get attention or looked at. I guess it takes somewhere with a little bit of courage to respond strongly enough to effect results. Originally seen on Digital Synopsis. There is a problem with that title, I know. I'm not entirely certain what the politically correct term is but I know it's not handicapped spaces. I'm not certain if it is accessible parking spaces or barrier free parking spaces. In Saskatoon and most of Saskatchewan those terms would be as literally incorrect as they are politically correct. I chose this title because, as outdated as it is, it is the most easily recognizable term that is understood by the most people. It's not that we are not grateful for them because we are. It's that seldom are they wide enough to deploy a ramp or a lift and then still have enough room to exit the vehicle. Heaven help us if there is a median, as is common in the construction of current parking lots. Medians may protect vehicles from carts but they do not allow us adequate space to enter and exit our vehicles and they are the perfect place for snow to build up against, making the spot even smaller in winter. Often the only way is to park right on the driver's side line or park at an angle so we don't get blocked in. Far too many times I hear about peers of mine having notes put on their window, telling them what horrible drivers they are, because they were protecting their own interest and safety by parking at an angle. One more reason why I hope this site and this specific post reaches a few able-bodied people. This is one of the most public and visible struggles and adaptations to the average person. This summer would you do us a favor and take a look at the lines in the parking lot? Try to remember how wide those spots are and, this winter, when you are desperately seeking that parking space a precious 10 feet closer to the door, remember we need that extra room and that spaces are designated as wider. If you are ever in a larger center in Alberta, British Columbia or Washington state, take a look around. 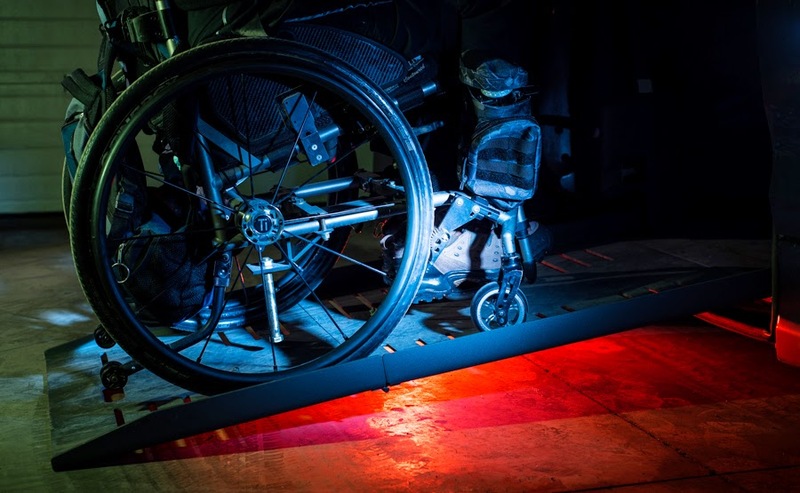 Their spots are wide enough for both the vehicle and a ramp, and have designated marked off sections between each for a person to exit the vehicle, be it transferring into a wheelchair from the driver side, or exiting a ramp or lift on the passenger side. Finally, regarding the parking spaces, to those who don't lose sleep over using them occasionally, I know you are just running in, but you might very well be taking up or blocking a critical spot for a vulnerable person who needs it or is trying to get back to their vehicle. We only wish we could just run in. The second portion of this post is regarding the parking placard hanging from my mirror. Thankfully North America has standardized the format and any time you see a placard that size and that colour, regardless of where it is issued, you can know its purpose and so can parking enforcement officers. On the front side is a sticker as issued by the city of Saskatoon which allows a person to park at any unreserved meter belonging to the city (this excludes the University campus or Innovation Place) for up to 36 hours. This is invaluable when we cannot easily come out to move our vehicle or when we quadriplegics have difficulty putting coins in the meter. Most the time, half of the coins end up in the gutter and parking costs us twice as much. Yes, the city is switching over to more automatic meters and they are uncertain how they will handle these stickers in the future. As of this writing this sticker system is the case. This I say to those who think we are getting a free ride, they do cost us $20 a year and I would gladly pay more for the convenience. Finally, take a look online before you travel to a different city. Some places, like Seattle, allow free parking to anyone with an issued placard. This was great, convenient, and perfectly affordable during our visit some two years ago. However, that city has cracked down on the number of improperly issued permits. Too many people were using expired temporary ones or did not genuinely need the helping hand. I respect the City of Seattle for their decision to prevent abuse by those who would occupy a spot that could have been used by someone with a greater need. Placard Source: Abilities Council or applications can be found online. A doctor's approval is likely necessary. One final note about the photo. The pink in it is a tribute to the pink neon light I was so fond of in my old 1981 Chevy Scottsdale. Hill climbers, or hill stoppers, have been one of the best technological additions I have ever experienced. The particularly grippy Q-Grip push rims that I enjoy are a great help but they are still susceptible to wet conditions. If they get much moisture on them your grip was gone when it came to contact between them and The Gloves. These hill climbers, when properly adjusted, are unbelievably effective at digging their sharp teeth into the tread and preventing lost ground. Even when the wheels and rims are caked with snow and moisture, these grippers allow you to take a rest, get a grip on either the wheel or a spoke, and inch your way up a slope. No rush to speedily give your chair a push and get your arms back in time to prevent losing ground from the slope. One of the worst circumstances is when you give a hard push and your hand slips off the rim due to lack of grip. In a case like that you not only lose your forward momentum but can often injure a finger and have difficulty regaining your grip to prevent losing ground or spinning entirely around to be going down the slope, headfirst. A situation like that happened to me out on a path down by the river, when I lost my grip and ended up being bent over with my head between my knees barreling down a hill. With no trunk muscles to sit me up, and my hands trying to slow me down, I thought for sure that I was going to end up on my face on the asphalt or in the grass. These hill climbers would have prevented that. When they are not properly adjusted, or if your tires are low on pressure, they can let you down. We have found them to be the most effective when used very slowly and intentionally. That is, after engaging them ensure that they are doing their job, then slowly push forward up the slope followed by gently releasing your grip to ensure they are holding before taking another stroke of the push rims. If they are adjusted to be closer to the wheels, when engaged, they will wear down your tread and cause a lot of resistance for forward momentum. All the more reason they are best used only when climbing a slope, not for general wheeling. They have certainly got me out of some sticky situations where there were no other people around to lend a hand and they got me safely into my van on a very cold and snowy day. Source: Most ultralight wheelchair dealers and online. Installation was very easy and something easily done by someone capable of adjusting regular wheel locks. All Content Copyright of Challenging Reality Contributors. Awesome Inc. theme. Powered by Blogger.